It’s not that throwing axes while drinking whisky is a bad idea. It’s just a better idea if you’re with Blacktop Mojo. The guys from Palestine Texas (Matt James, Nathan Gillis, Ryan Kiefer, Matt Curtis, along with newest member, guitarist Chuck Wepfer from Milwaukee Wisconsin) are touring the country in support of their second album “Burn the Ships”. They just played their first festival, Rock fest, in Cadott Wisconsin, and joined rock’s elite by getting photographed and promoted by the infamous Lou Brutus. 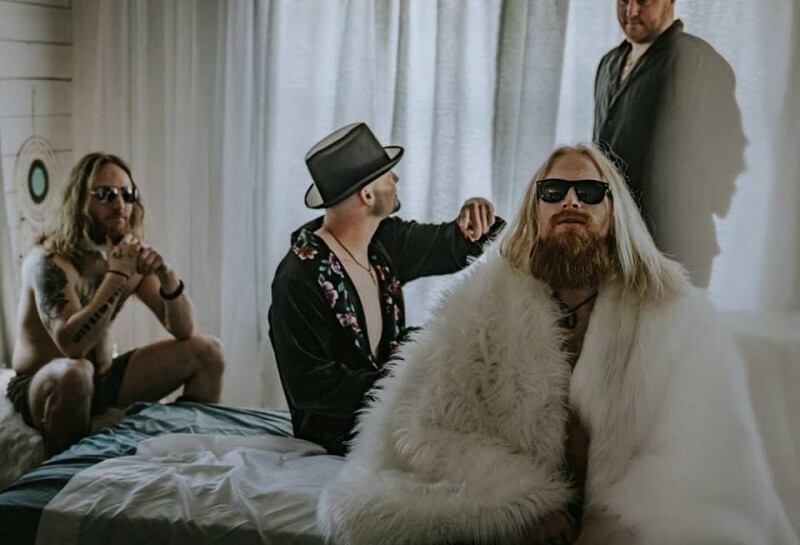 Blacktop Mojo’s down and dirty Texas grunge style is getting noticed, but not just for their original music. They do covers like no one else. I caught up with vocalist Matt James the day after he and the band did a promotional visit to an axe throwing arena. You’ve probably heard the Aerosmith classic “Dream On”. It’s been covered by almost every rock cover band in history. But, do you know any bands whose cover hit 5 million views on YouTube? There’s only one. Blacktop Mojo. These guys are so good that a spur of the moment acoustic cover of Phil Collins’ “In the Air Tonight” they threw together while they were touring a whisky distillery just hit over 1 million views on YouTube. When I asked Matt James if it really was a spontaneous thing, he said “Yes it was. We were drinking. A lot. At the distillery there, as you do. We heard the echo in that silo and said man we gotta go get a guitar and try to do something”. The result is incredible. Then there’s Blacktop Mojo’s latest cover of “Dreams” by Fleetwood Mac. This may be the most original cover I’ve heard in years. The guys collaborated with longtime friend and musician Alex Smith and turned it into a hard, beautifully painful sound, holding onto Stevie Nicks’ soul with both hands. “We heard our buddy Alex Smith do that a bunch of times”, James recalls. “Alex had a band and when we were first starting out, we’d open for them a lot. He helped us out a lot in the beginning when we had no idea what we were doing. We were asking for advice all the time and he was always there for us, and it was really cool to collaborate on a song with him. We’ve been playing with him for years and we’d been trying to get him into the studio and do that cover for a few months now. It finally came together where we could all be out there at the same time. It was really cool for him to come in there”. The band’s dedication to goofing off and having fun shows in the video, as guitarist Ryan Kiefer is seen pelvic thrusting in the background as Smith sings about love lost. I asked James why he chose to do backup vocals on the song instead of lead. “Well, Alex sings it so well, and it’s about the music. I didn’t really want to get in the way of that”. It’s that humble dedication to music that makes Blacktop Mojo THE band to watch right now. Well, that and seeing what will come after drunken axe throwing. That one is hard to top. The band will continue to tour supporting their latest album “Burn the Ships” through this fall. Then it’s into the studio over the winter to finish off their third album and hopefully release it spring 2019. You can see Blacktop Mojo live at The Annex at the Red Zone in Madison Wisconsin on August 7th. Tickets are only ten dollars, so get them while they last.